We’re going to try something a little different this week, a two man review. 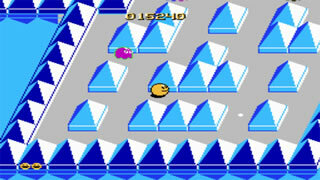 Both Red Conine & Rhys Wynne from Retro Garden will be looking at this week’s game – Pac Mania. Two of the most classic retro-games (Galaga & Pac-Man) have had many sequel and remake games. I’d like to focus on one of Pac-Mans, Pac-Mania. Pac-Mania itself was ported to fifteen different computers and consoles (Iwill be reviewing the NES port). This game was the new Pac-Man. However, going into it, it doesn’t have a whole lot to offer. I like Pac-Mania but that’s because it was a lot like Pac-Man. The game is basically the same. They do make the game 3D and it looks rather good. The sides of the board that would transfer you to the other side are simply a tunnel to the other side. This will leave people who depend on logic too much baffled. The graphics flicker a bit but I blame that on my emulator. The actual game play, well, what is there to say? It’s exactly like Pac-Man. Yes, the game offers four different areas but they all are the same except some scenery change which I suppose is nice. If you are good at Pac-Man, you are good at Pac-Mania. So, the real question is which you rather play? In all honesty, I would rather just play Mania. It looks better but plays the same and would seem more fun at home. If I had a cherry soda in a glass bottle and saw a Pac-Man machine, I’d just die in Nostalgia heaven. I have the pleasure of saying I have done this. In all, Mania is just a polished version of Pac-Man. That isn’t a bad thing but it just makes the game melt into the background with nothing special to stick out. 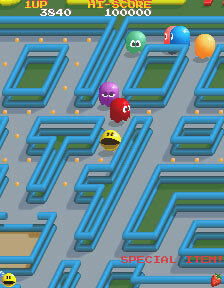 In closing words, if you like Pac-Man then you really should play this game. For everyone else, it’s just another cartridge on a shelve. I’ll be honest, this game is my favourite iteration of the Pac Man series. Something about this game made it much more playable than the earlier games. I had it for a number of systems, but all pailed in comparison to the arcade experience. It was Pac Man, it was 3D, and it had the ability to jump. I was never very good at the original pac man games, so this made it a hell of a lot easier. If you only way one other iteration of classic pac man, then make sure it’s this bad boy, as it’s accessible, with great graphics, addictive music, and fantastic gameplay & cutscenes. I would advise against playing the NES version of the game though, it isn’ t the best. Hunt out one of the version on the 16 bit computers, C64, or arcade. You won’t be disappointed. I loved the arcade version of this game!